His life story appeared in some of the most important newspapers with global circulation, from the New York Times to the Daily Telegraph, the Wall Street Journal and Le Monde, just to mention a few, which recommend his pizzeria as the best one in Italy. Sole recourse to quality ingredients, deep knowledge of the tradition and the territory, and, above all, passion for his job: these are the ingredients of his great success. Born in 1962 and a contagious passion that began when, still a child, he used to help his father, Antonio, in the family pizzeria. Grown up in the working-class district of Duchesca, behind Piazza Garibaldi and the Central Station, he soon realized that the profession of pizzaiolo was what he wanted to do in his life. After a few years, he decided to take on a first challenge opening the doors of his pizzeria, or better pizzAria, as in the old way, La Notizia. It all began in 1994 with a movie, that of the famous film director Orson Welles, Citizen Kane, one day he saw and was inspired by it: Charles Foster Kane said that “if the headline is big enough, it make the news big enough”, in the same way, if the pizza is big, La Notizia quickly becomes important. Embracing from the beginning of his career the sole use of the best Campanian ingredients as an authentic categorical imperative, the master pizzaiolo Enzo has been able to turn this working-class product, known in the farthest corners of the globe, into a genuine culinary delight. 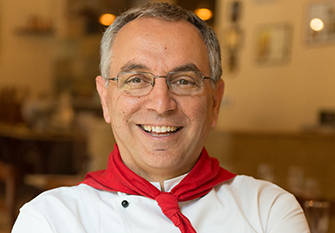 Tenacious defender of quality and one of the guideline editors, Enzo Coccia fought in the certification process for giving to the Neapolitan “queen” the Traditional Specialty Guaranteed status, officially recognized by the European Union in 2009. The intention was, and still is, to protect the undisputed star of our daily lives. Hence, the decision to found, at the beginning of the third millennium, a consulting and training company, Pizza Consulting, so as to teach this complicated art, which made ​​him famous all around the world, and defend it from false imitations. From Japan to Canada, through India, Africa and the United States, many students come to learn the techniques and the secrets not of a mere recipe but of an ancient craft, handed down from father to son. His teaching activity is then enriched by the special experience with some Neapolitan primary school children. For two years, between 2005 and 2007, he took part in a nutrition education program, as vice-president of Ed AL. BA. (Food Education for Children), in order to let them know and recognize, playing and having fun, touching and tasting, the quality of the ingredients, different toppings, added to the dish loved by adults and kids. A constant push to an increasingly deeper knowledge of the products and their origins led him to attend a Master’s degree on “Food traditions and cultures of the Mediterranean people” at the Suor Orsola Benincasa University of Naples. However, those who think that Enzo Coccia is a man locked into the strong Neapolitan traditions are in the wrong. In 2010, motivated by the desire to experiment, he decided to open another La Notizia, on the same street, a little further down, at number 94, to offer new flavor horizons, supporting innovation and opening the door to what many people have called “gourmet pizzas”. Figs, fresh cod fish, lemons, truffles are just some of the unusual ingredients that you can find on the new pizzeria menu as well as the reintroduction of the ancient pizza and wine pairing, supplanted by the beer overwhelming power for a long time. Putting the knowledge acquired during the sommelier course with AIS of Naples into practice, unstoppable Enzo sketches out, like a tailor-made dress, the perfect link between wines and pizzas. His innovative approach has aroused many reactions among the traditionalists. The Neapolitan Association of Pizza Makers, of which he was a founding member, do not linger on saying that pizza, as a working-class product, doesn’t have to be so complicated to avoid a lack of identity. Despite the controversy, La Notizia has been the first pizzeria to be recommended by the influential Michelin Guide and fork awarded since the opening. On December 7, 2017, UNESCO recognized the Art of Neapolitan Pizzaiolo as an intangible cultural heritage of humanity with inscription 12.com 11.b.17 No. 00722. On that occasion, many events and celebrations were arranged for an art that made Naples famous all over the world. Enzo took part in many initiatives including the visit of the Minister Dario Franceschini to the Queen’s oven at “Giardino Torre” in the Royal Palace of Capodimonte. Here, a plaque was put up to recall the pizza made by Raffaele Esposito on June 11, 1889 in honour of the Queen Margherita of Savoy. 2018 starts with another important designation. With Ministerial decree n.94 of February 8, 2018, on February 20, MIBACT, Ministry of Cultural Heritage and Tourism appointed Enzo Coccia, along with 11 other experts, as member of the Technical Coordination Committee for the Year of Italian food as representative and greatest expert on the Neapolitan pizza.